Yellow beehives on meadowland in Risjnak National Park, Croatia. Croatia has a long history of keeping the domestic honey bee, Apis mellifera, and producing honey. 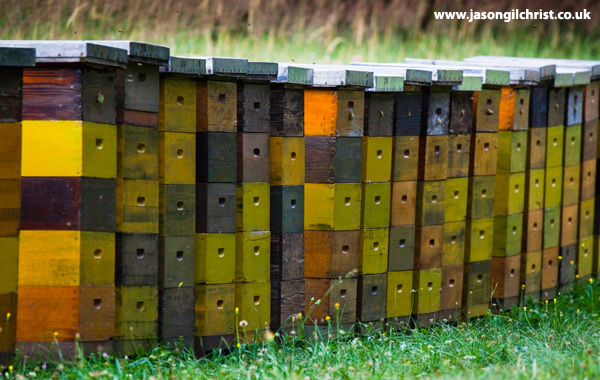 Scientists at the University of Zagreb have trained bees to detect unexploded landmines left after the war between the Balkan nations of former Yugoslavia in the 1990's. Such mines, lie undetected under the soil, and pose a serious risk to people. Hundreds of Croats have been injured or killed by mines after the end of the war. Specially trained bees help de-mining teams clear mines. The bees are trained (via Pavlovian conditioning) to sniff out and be attracted to the smell of TNT explosive by associating it with a sugar food reward. You can learn more about the mine sniffing bees @ http://news.bbc.co.uk/1/hi/world/europe/6701517.stm, and http://www.wired.co.uk/article/landmine-bees.